After joining Credit Karma and getting back on track building my credit, I began looking for a credit card to meet my needs. I noticed that this card had two options, one with an annual fee, and one that didn't. At that time, my credit score was only a 560. My odds of getting the one without the annual fee didn't look good, so I didn't apply. I waited almost 6 months and my score was around 620. I applied for the one without the annual fee and was approved with a $1k limit. I also received the $150 welcome bonus as advertised after spending $500 in the first 3 months. After a little over a year of working hard to rebuild my credit, I now have a $3k limit and a credit score of 760. There were other methods involved that resulted in me raising my credit score this high in such a short amount of time, but this card has really helped! The 1.5% cashback is awesome, and Capital One's website is very easy to navigate, login, and pay what you want when you want. I highly recommend this credit card. No reason for lowering credit limit. I have had this card for 14 years with a $30,000 annual credit limit. Unfortunately, I pay the balance in full every 30 days. I received an e-mail that my credit limit has been lowered to $10,000 because I do not use it enough! Well, I do use it a lot, but I pay the balance in full every month. I can use home equity if I need more credit for a large purchase, but this makes no sense. I want to find another card that will not do this, if any exists. I had the Platinum card and didn't see much upside off it. I had gotten better card's in the mean time with rewards so the Platinum card had lost it's usefulness. 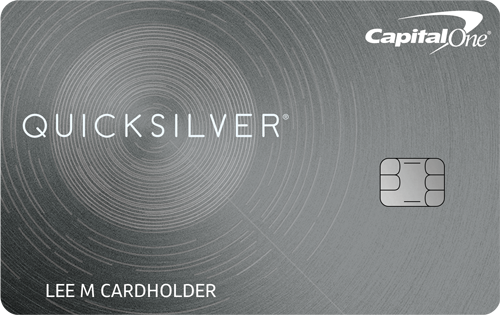 I called Capital one and asked if I could upgrade to the Quick silver. The first offered the QS one but I told them that I didn't want to have a annual fee and the relented and approved me for the QS. I have not had any problem with Capital one and hopefully it stays that way. The only little issue I have is the lower CL with them compared to all my other cards. I don't keep balances on any of my cards. Will start off by saying this is a great, simple card with solid cash back and no annual fee. My only complaint is my low credit limit. I was approved at $1000, and have only been able to go up to $1200 in the 9 months of having the card. I have other cards with limits as high as $15k. If you’re loyal to cap one and don’t want an annual fee, this is definitely your card. As for me now, it’s a sock drawer card that I put my Spotify bill on. So according to CreditKarma my odds of receivig this card is poor. The thing is I have had this card for almost two years and I received it when my score was about 40 points lower than it is today. So much for the odds. This card is slow to build a CL. CapitalOne raised my CL once and has denied all other requests. Still it is great for building rewards. If making payments from a debit card your payments will post immediately. When you make payments from a linked bank account the payments will post the next day I am in the garden watching my credit grow. Great card rewards every charge. I am rebuilding my credit and it is great to gtet cash back. I have had this card for one year now and recently asked for an increase and was granted a $500 increase in credit. Their on-line systme is easy to use and being paperless and able to make payments anytime it great. Once I established my banking my payments get applied immediately. I use this card alot and make payments several time throughout the month. This allows me to keep earning more cash back. High Apr, low credit limit, monthly interest charges ridiculous. If you have it cut it up. If your building credit this is not the card for you. No increases in credit limit after 2 years of never being late. Always paid above the monthly charge. I’ll tell you what’s not gonna be in my wallet. Just paid it off in full. Free at last. Right! When it comes to credit, the more the merrier. Never know if have an emergency too. Might regret it. It is a really good card for people starting to gain credit history. I highly recommend the card due to the low annual fee. I also recommend it because it’s a really good company. I got approved with a 600 credit score. The card offers a simple cash back system that you can redeem in a couple different ways. The app is very easy to use and I like its interface. I’ve called customer service on a few occasions with questions and to file disputes and have had no issues whatsoever. I have no complaints from this card. When I applied I had around a 720 score per credit karma and was approved for $2k then six months later my limit was raised to $8k. This was my first credit card in my own name. I love this credit card! It give me cash back and I apply it towards my balance. I use this card with moderation and pay my monthly payments on time and I always pay extra! My credit score is now in the high 600! It has helped me a lot! Less than one year after my bankruptcy. I was approved for $3000. Had to do a fraud prevention call but was worth the 3 week wait.